Disease, debility and injury are common events in the course of life and act as a natural control on population growths. Natural selection favors the survival of the fittest individuals and ensures that all weaker gene pools are eliminated from existence and only the fittest, strongest, most beneficial genes are passed on through the generations. Although you will often find injured animals, most injuries commonly seen today are due to anthropogenic causes. We must not only strive to remedy but completely prevent such injuries wherever possible. This website intends to detail rescue and rehabilitation protocols but not medical procedures or advice. Sick and injured animals require veterinary attention and care and such literature must in no way be a substitute for veterinary attention. If you do find an animal that needs help, it would be best for you to rush it to a veterinarian or your local rescue center or zoo. The page below simply aims to help you understand the common causes of distress and how to address them. Although it is rare to stumble upon a baby animal with a congenital defect in the wild (as any animal with severely hampering defects will rarely survive), there are many defects that may benefit from timely medical intervention. It takes most predators at least 2-5 attempts before successfully hunting down a prey. 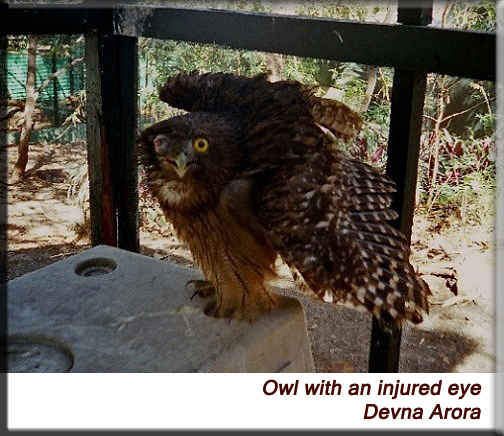 Animals often escape from the clutches of a predator but sometimes with severe injuries. Such animals may not only have severe injuries but also harbor high levels of stress. The level of shock and stress being very high in such animals, they require intensive medical intervention and care. Baby animals that escape from predators often also get separated from their mothers and effectively become orphaned and unable to fend for themselves. They must be shifted to care facilities for treatment and hand-raising; a reunion with the mother/parents may be attempted at a later date once the baby animal has healed. If not reunited, the baby animal must be released at an appropriate time and age. Similarly, prey species may also induce life threatening injuries to predators, some of which may heal over time while some may not. Infighting injuries are mostly seen in adult males as they fight for territories or mating opportunities. While most of these injuries may not be severe, some species may fight to death. Anthropogenic pressures on forested landscapes and wild animals alike have been on the increase. Many animals come into situations of peril directly or indirectly because of people. Again, animals are left injured due to accidents or unsuccessful poaching or hunting, due to snares and traps left behind for poaching, or due to a confrontation instigated by human invasion into restricted areas, or injuries caused during a chase as people attempt to scare an animal away from human habitation. Nests are sometimes destroyed as trees are felled. Vehicular collisions, that pose a grave threat to the animal under concern, are also on the increase. We must not only attempt to correct but completely prevent such situations. Animals have evolved with an inborn immunity to most pathogens in their environment and can survive past the natural course of many diseases as long as they have safety from predators and a continued food source. An animal under human care may additionally benefit from veterinary care. An epidemic will likely affect at least a significant proportion of any population and will need to be addressed at a large scale. Some diseases may also be zoonotic in nature (i.e., they can be transmitted to humans) and you must obtain advise from your veterinarian on how best to handle and help such animals. Unless there are severe environmental changes and imbalances that affect the health and wellbeing of the entire population, malnutrition may most commonly be found in either dispersing sub-adults or old animals that are well past their prime. Dispersing sub-adults, that have just become independent of their mother’s/parent’s care, may be unsuccessful hunters or foragers and may temporarily suffer from lack of nutrition until they perfect their hunting/foraging skills. Similarly, old animals may be unable to hunt or forage effectively due to lack of strength, fallen teeth, loss of vision, etc. Although malnutrition by itself may seldom be the primary cause of death, it predisposes the individual to predation and disease. Although such events are a natural occurrence in any given population and human intervention must always be minimal, there may be nothing wrong in providing supplemental feeding temporarily. Dehydration may be a common problem for many animals during peak summers. As most animals consume sizable quantities of water through their food, malnutrition and dehydration often go hand in hand. A simple offering of food and water for 2-3 days may benefit most animals, while those that are severely dehydrated may need additional help. Rehydration solutions may be either given orally or preferably injected when dehydration is severe. Animals have remarkable healing powers and many minor injuries can be addressed in-situ. Only when necessary, must the animal be shifted to a temporary care facility. For anything serious that may take more than a few days to recuperate, it would be necessary to seek guidance from a veterinarian and shift the animal temporarily to a facility. The primary purpose of rescuing any animal is to return it to the wild. But, there will often be animals that will never be fit enough to survive on their own again. For example, a bird with a broken wing – although the wing may heal and the bird may be capable of flight, some birds may never truly have the agility required for their survival. Animals that are not fit enough must either be considered for placement in lifetime care centers or euthanasia. Although euthanasia has largely been a controversial subject, it is more commonly acceptable in the field of animal welfare. The decision must always be made with the required permissions and always in the best interests of the individuals in concern.